I also love the many fun challenges I come across on there, as well. From bullet journaling, handwriting, and drawing challenges, I enjoy seeing them all! However, I've been itching to find one particularly with a travel journal theme. So after months and months of searching, I never did came across one, which left me with only one other option.... to create my own! And so I did it. I created my very first Instagram photo #TravelJournalChallenge. 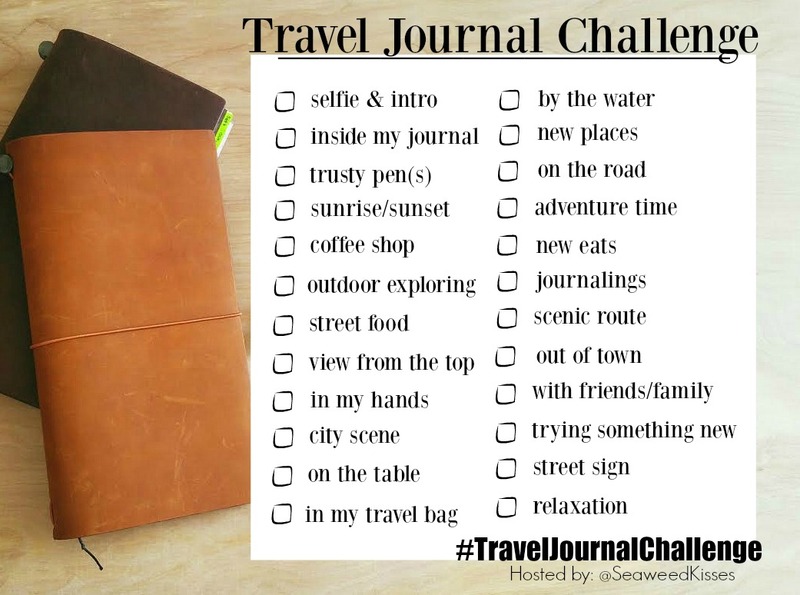 Inspired by my love for traveling and travel journaling, I thought, "What better way to incorporate them both with these fun photo prompts for the summer!" You'll notice that the list pictured above is not numbered by the days of the month, like most challenges, and that's for a reason. I want this to be something that can be taken and experienced anytime of the day, week, or month. There is no rush, no particular order to go by, and no limits to the imagination. The goal of this challenge is to creatively capture day-to-day adventures with any beloved travel journal. Now, go out and see more things, be inspired by everyday surroundings, travel to more places, and document your daily adventures along the way! Have fun, my friends, and I'll see you on Instagram!